The so-called Polisario’s coordinator with the UN mission in the Sahara “MINURSO”, M’Hamed Khaddad, was dispatched to Moscow on a mission, where he has, in all and for all, taken a simple cold shower, after a meeting with Russian Deputy Foreign Minister, Special Representative of President Vladimir Putin for Middle East and Africa Affairs, Michail Bogdanov. In a statement released on Tuesday, Oct. 2, by his department, the Russian Deputy Foreign Minister simply stressed “the need to continue efforts with the international community to achieve a just settlement of the conflict, so as to improve the situation throughout the Maghreb region”. 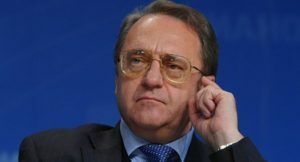 The Russian official did not make any reference to the option of a self-determination referendum, claimed by the Polisario and its mentor, Algeria. In the statement, Michail Bogdanov also reiterated “his support” for the efforts of the UN Secretary-General’s personal envoy for Western Sahara, Horst Köhler. The novelty in all this is that the Russian Official’s statement was relayed faithfully by the Algerian “APS” and Sahrawi “SPS” news agencies, which used to add their magic phrase “leading to the self-determination of the Sahrawi people”. However, this time, the two agencies have avoided betraying the original text for fear of offending Russia, one of the five permanent members of the UN Security Council, especially that the Security Council is to decide again this October on the Sahara issue and the future of MINURSO. The Polisario executive thus returned to Rabouni empty-handed. His mission to Moscow, undertaken at the orders of the Algerian mentors, who were hoping to win support, even if symbolic, from Russian diplomacy to the chimerical claims of the Polisario and to the fantasies of the Algerian oligarchy, proved a failure.